Master Choe (American name: Brian Hall) is passionately committed to the tradition of the martial arts--stressing excellence not just in technique but in everything a person does. He began his training during his childhood in Korea, where he was steeped in the tradition, history and principles of the art as passed down from the great masters to their pupils. As a result, he has never been willing to strive for less than the best in his pursuit of becoming a true martial arts master. His rank of 5th Dan Black Belt in Taekwondo is recognized not just by the school which issued it, but throughout the world. 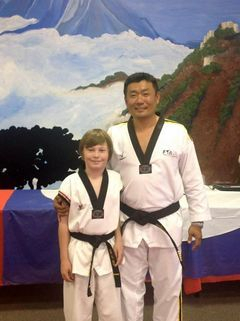 Master Choe completed the rigorous testing process required to earn the prestigious KukKiWon certificate--official recognition of his own martial arts mastery, eligibility for international-level Taekwondo competitions, and commitment to train his own students by world-class standards. Master Choe’s desire for excellence is evident in his teaching style. He intentionally invests time and energy in every student who walks through his door, not just the ones who look like potential athletic champions. Students and families alike express their appreciation of his teaching, which is infused with his deep commitment to pass on the time-honored traditions of the martial arts. 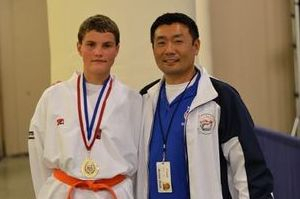 He lives out this commitment not just through teaching in his school, but also through his position as Vice Secretary General of the Florida Taekwondo Association. Master Choe is a certified massage therapist with training in body mechanics and experience with treating sports injuries. His greatest desire is to help his students not to settle for just becoming competent at martial arts techniques—but, rather, to catch his own passion for personal excellence and take it into every aspect of their own lives.